Thank God for airconditioning ! These past weeks have been extremely hot and the heat is enough for anyone to stop doing anything and just conserve energy. I started using my airconditioner for extended periods of time just to ease up on the heat. But even my aircon unit couldn't fight the heat of the day even at high fan speed and maximum power. At this point, I knew it was time to have my aircon unit serviced. You can clean the filter once in a while by yourself but when it comes to cleaning the insides of the aircon, you need a specialist. Good thing home service is only a phone call away. 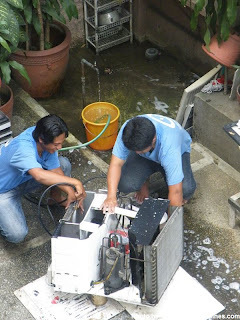 The 2 aircon specialists came the next day and pulled out my aircon unit to clean the insides. And it was shocking how much dust and dirt has accumulated inside. 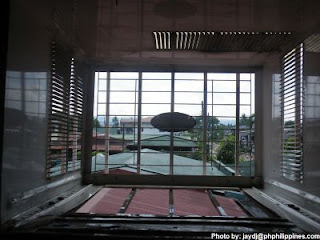 Of course, the way an aircon functions doesn't make it unusual how dust and dirt can cling inside. While the unit was being cleaned, I also decided to clean the aircon bracket where the unit is housed in. When all was clean, I noticed the change and quality of coolness the aircon blew. And it's a big difference ! I suggest you have your aircon units checked and cleaned in time for the intense summer heat. Have a cool summer !